A little september shawlette, inspired by the lovely Ilaria. I love her choice of colour but feared by the time it was finished I might be looking for a more deeper wintery colour. In the shop both colours called, and continued to call. Clearly I am a woman caught between two seasons. The dusky blue felt like a wearable colour for me. I tend to wear a lot of blue and grey. After using a ball of the darker shade i knew i would simply have to start using the aqua, and I have to say that my heart did give a little skip of joy about that too. And now I am wondering if my little two-tone number will actually work. They say colour blocking is trending right now...... right?!.... I plan on crocheting a ball of aqua too and then slinging it around my shoulders nonchalantly. It looks lovely so far. I like the darker blue and lighter blue together. I think that little shawl is gorgeous Heather - the colours are very appealing and that little shell pattern is very effective. I'm sure you'll love wearing this and you may want to do another one using the navy again and adding a soft pink this time? Just a thought! Thanks so much for your message on mine - lovely surprise! Heather that will look so right on you...its gorgeous...thank you for the link to! 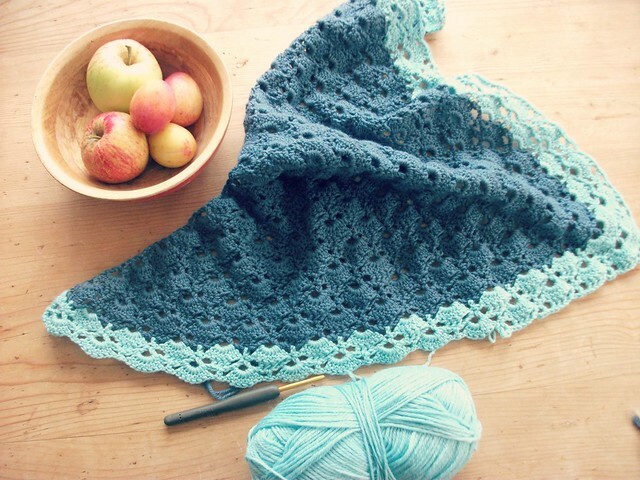 I am going to look at that pattern.I knit shawls but don't crochet as I am left handed and often can't follow the pattern but I think a symmetrical shawl would work.I need a new challenge and this might be it.Thanks.I'll let you know how I get on.Feel quite excited! beautiful colours and I think they really fit you pretty well!!!! Heather.I followed the link and signed in but couldn't find the pattern.There were only three shawlettes and none of them were yours.Help.Does it have a name? yes it's south bay shawlette. In the pattern it's purple and little difficult to recognize. If I hadn't seen Ilaria's shawl, i wouldn't have recognized it either! Hi Heather,Thanks for the link!! !I have bookmarked it as a favorite!! !I love this little shawl, it's really so me!! !Unfortunately it will have a to wait a bit!! !It will still be awhile before my craft space will be up again!! !Have a happy week!!! Mmmm, it's lovely -- such a pretty motif! Oh hello! I'm making the VERY same shawl. Its stitches popped out at me the moment I clicked over here. Your colour choices are so beautiful. I'm using Manos silk blend in Europa - a little like a Scottish hillside. How I love those stitchy scallops. the color looks amazing, very much my cup of tea.